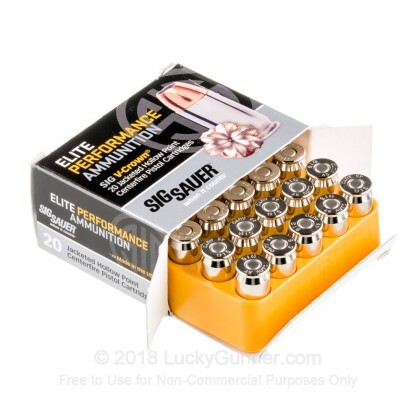 Sig Sauer has designed and built a series of premium quality self-defense ammo, featuring their proprietary V-Crown Jacketed Hollow Point projectile. 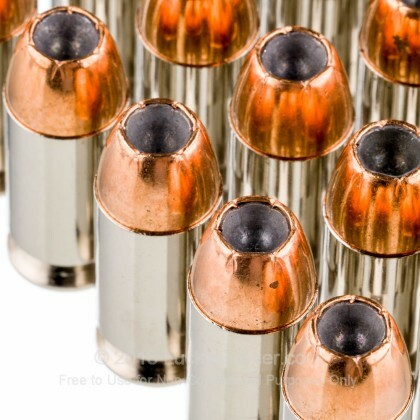 Sig designed this round for massive expansion and devastating terminal ballistics. These rounds are loaded into nickle-plated brass cases for smooth operation and corrosion resistance. Each round is boxer-primed, non-corrosive and reloadable. 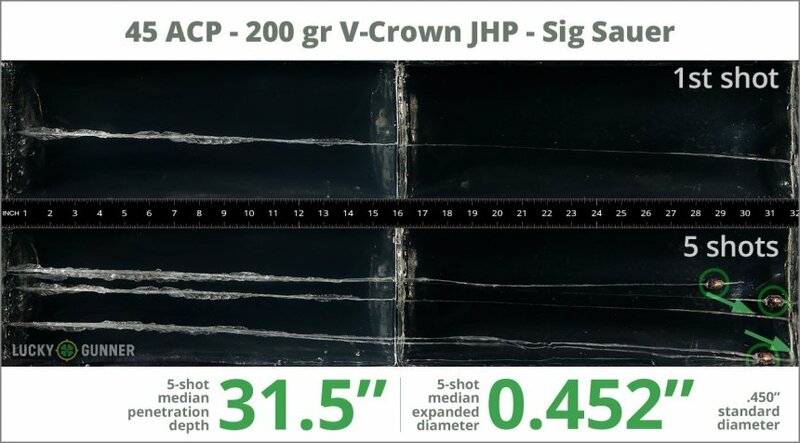 We test fired five rounds of .45 ACP (Auto) Sig Sauer 200 gr V-Crown into synthetic ballistic gelatin to observe its expansion and penetration characteristics. The ammo was fired from a Kahr CW45 pistol at a distance of 10 feet. A four-layer barrier of heavy fabric was placed in front of the gelatin to simulate clothing. How do the results for this SIG SAUER .45 ACP (Auto) compare to other 45 ACP Ammo? 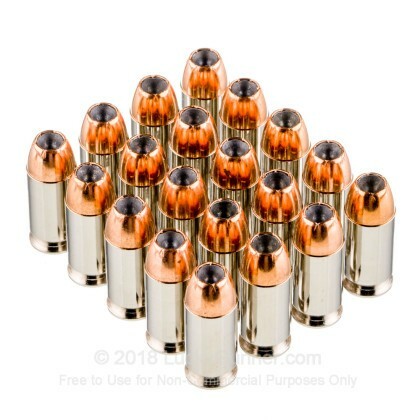 1.04" This ammo: 0.45" Min: 0.45" Median: 0.64" Max: 1.04"
31.5" 0" 8.3" 16.7" 32" This ammo: 31.5" Min: 8.3" Median: 16.7" Max: 32"
I tested this ammo awhile back in my classic "water jug" test with 4 layers of denim. Before I say more, I just want to point out that this test performs identical to ballistics gel as far as what it does to the bullet, and I have tested dozens of cartridges with great performance. 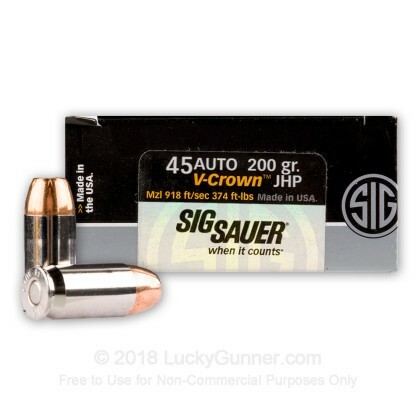 The Sig Saur V Crown was terrible in the .45 ACP 200 gr and also the 230 gr variant. Absolutely zero expansion and as much penetration as an FMJ. I also chronographed the 230 variant out of a 5.3" Glock 41 and got less than advertised velocity by about 10 fps. My friend tested the .40 S&W and I tested the .357 Mag versions of the V-Crown, and with those you get nothing but fragmentation and jacket separation. 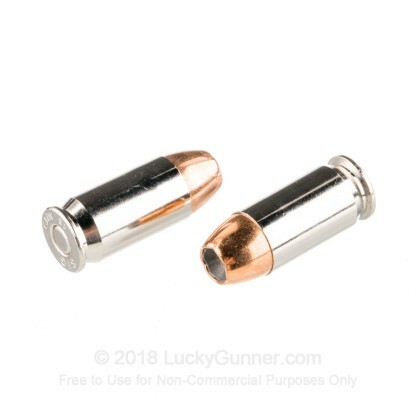 There seems to be no reasonable middle ground with Sig ammo, the lead alloy is too hard and there is no bonding, both of these issues are apparent. I am using a Ruger SR1911 4.25" and I had problems with this ammunition right out of the box. I loaded up my magazine and tried to chamber a cartridge for testing and it jammed up in the breech. I shoot Federal FMJ for practice on a regular basis and have never had issues with this firearm. However, when I took my SIG JHPs to the range to see if the problem would persist I had FTF every second or third cartridge. This ammunition appears to be of good quality and it was $10 less than any other .45 JHP on the shelf, but it was a terrible experience in my firearm. I switched to Federal JHP and have not encountered the problem again. Runs clean. Tried Critical Duty by Hornady and Remington Golden Saber. Failure to feed on several occasions for both. Not the Sig though. Took out a Feral Pig out back that was chasing my Yorky, first round was a G9 185 gr. .45 ACP hit mid-shoulder got his attention. But the next was a Sig-Sauer 200 gr. V-Crown put his nose in the dirt, lucky hit in the neck right behind the head. All from a Springfield XDs 3.3 inch @ about 15 paces. I might be Master Qualifier but both rounds were LUCKY. Lexy my Yorky really can run! 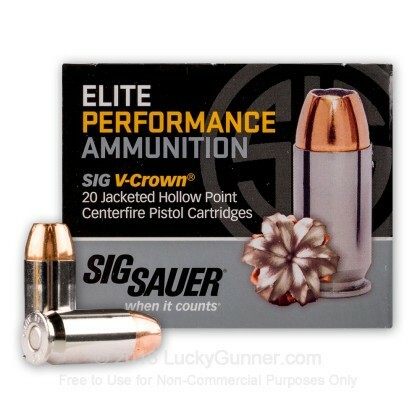 This Home Protection ammo is great ... works good in my sig 1911 and fast delivery with great price always helps. A beautiful solution to older 1911's that don't like to eat anything but Ball ammo - this does the trick! IMO, SIG has always made top-notch products and this doesn't disappoint. It's not 'cheap' by any means, but well worth it if you need it.